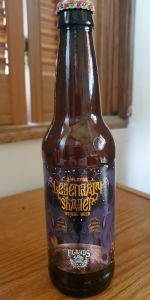 Drunk Monk Hefeweizen | 3 Floyds Brewing Co.
Bottled 7/1/15; drank 7/11/15 @ the Yarchives. Opaque orange appearance; champagne bubbles throughout. A rough pour yielded a loud eggnog head which quickly dissipated; no lace. Banana, clove, mild citrus & faint black pepper notes in the nose. Banana & mild clove flavors up front; smooth caramel finish with black pepper bite on the lips. Faint booze heat emerged as this warmed. 7/28/18: $8 22 oz bomber purchased at Three Floyds in Munster, poured into large chalice. Cloudy orange pour with generous fluffy cloud like white head, solid carbonization on pour. Strong banana and wheat aroma, nice slightly sweet, very pleasant. Excellent flavor and balance, banana, wheat and other fruits. Creamy texture and mouthfeel, very smooth drinking. Excellent offering, one of my favorite Hefeweizen's I've had. Have wanted to try this beer forever. Poured from a 22 oz. bomber into a weizen glass. Perfect one finger very light tan crown sits on top of a straw-dark golden colored beer. Not clear and a little murky. Can see my finger on the other side of the glass. The smell is that beautiful traditional hefeweizen smell. Bananas are huge followed by a vanilla bean like sweetness. The taste is much less prominent on the bananas are provides more balance than I expected. That vanilla bean like sweetness is still there, but the balance in it all is great. Very, very slight bitterness in the back to finish. Wow, getting through the creamy and dense crown is amazing. It coats your mouth with the sticky sweetness. Overall, this one really surprised me. It surprised me not in the fact that it was good but the fact of how good the balance was. Especially coming from FFF. I'm a big fan don't get me wrong but sometimes I feel like balance isn't what they go for. They make things that are going to be in your face. This is a great traditional style hefeweizen. I'm glad I got to finally try this. Not much banana, but some. Same goes for the clove. Watery. Had fresh and on tap at the source in Munster, Indiana. A very pleasant hefe- that hit the spot on a hot summer day. Its looks, smells and tastes like the style's very best ... but 3 Floyds will not produce the standard until it controls the banana better... also a little less vanilla, please. I particularly like that this hefe- shows 3 Floyds versatility in the craft of making malt do the work and, unlike so many other brewers, not relying on hops to sell beer. I drank Drunk Monk 3 days later from a bottle I bought at the source and dropped my original Overall rating by .25. But still highly recommended. M - light mouthfeel, alc covered, aftertaste is banana, yeast, pepper? Bread? Taste: Crisp, Belgian yeast bread, cider, semi sweet. Malt and wheat semi sweet nose. Gold/Amber color, opaque for the most part with lace on glass. Medium body. Easy drinking. Drunk Monk Hefeweizen from 3 Floyds Brewing Co.